New Item! Discover the natural goodness of peanuts with a local twist! 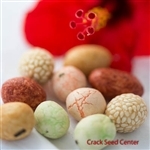 Mix Mochi Balls are similar to Iso Peanuts and come in a crisp cracker shell which is lightly sweetened, but these have a variety of cracker shells. You may also like our Wasabi Iso Peanuts for a spicy kick. Ingredients: Rice Flour, Sugar, Peanuts, Wheat Flour, Soy Sauce (Water, Soybeans, Wheat, Salt), Modified Food Starch, Potato Starch, Salt, Sesame Seed, Leavening (Ammonium Bicarbonate (Baking Soda)), Seaweed, Monosodium Glutamate, & Color (Tumeric, Paprika, Oleoresin FD, Yellow #5, Blue #1).